Mattress Exxpress - YOU'RE ONLY A BED AWAY FROM A BETTER DAY! Stop in to see our wide variety of home furnishings. We are locally owned and operated. 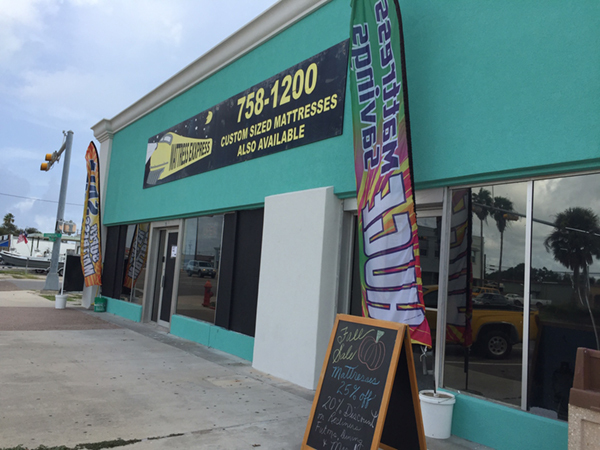 Since 2010 we have provided Aransas Pass and the South Texas Coast with selection, value, and service in mattresses and furniture. We understand how confusing the shopping experience can be when selecting your new sleep set. We have over 80 years experience to help you select the mattress that's right for you. Whether you're looking for a bed for yourself, your kids, or the spare room, we are your mattress store. From bedroom furniture to bunkbeds, we have everything you'll need for a good night's sleep. "You're only a Bed away from a Better Day!" Bed Sets – a large selection of mattresses, bed frames, and bedding. Bedroom Furniture - dressers, night stands, and chests. Furniture - Living room, den, kitchen and more. Contact Mattress Exxpress today at 361-758-1200 or browse the website for more information about our products and services. Mattresses - Futons - Sofas - Recliners - MORE! Layaway Available on All Merchandise! We are located in Aransas Pass, TX but within a short drive to the Coastal Bend cities of Rockport, Fulton, Sinton, Port Aransas, Gregory, Ingleside, Portland, Lamar, Beeville, Alice, Falfurrias, Refugio, Corpus Christi, Taft, Goliad, Kingsville, Raymondville, Odem, Robstown and Aransas County. Please don't confuse us with another company, we are Mattress Exxpress.